You've chosen the most beautiful island! 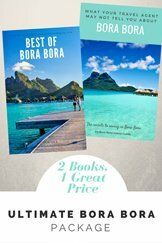 Now which of the top Bora Bora luxury resorts is the best? 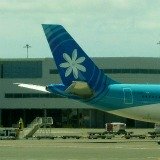 Two 5 star resorts, St Regis Bora Bora and Four Seasons Bora Bora, vie for title of “best Bora Bora resort”. 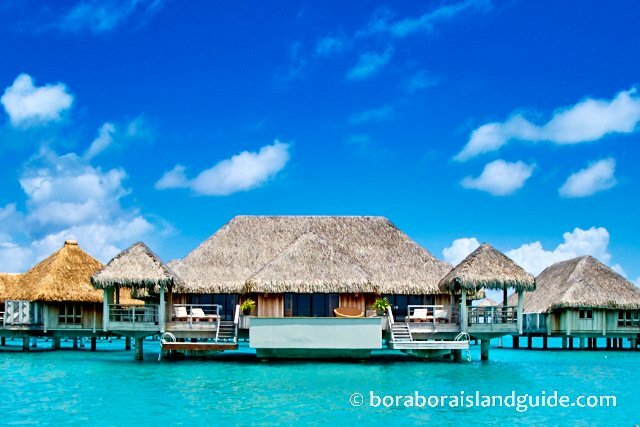 Both of these Bora Bora luxury resorts are gorgeous and their rates are similar. So let's compare the experience each offers. 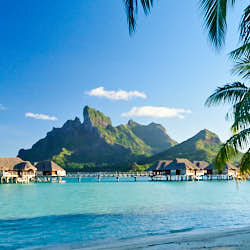 These Bora Bora luxury resorts are on neighboring islets of the coral ring forming the east side of the calm lagoon. Stay at either and you'll think you've been given the key to heaven! 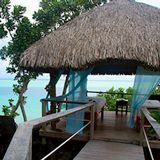 Both hotels offer similar, outstanding views across translucent blue water to Bora Bora Island. At the St Regis there's also a selection of private on-land villas. St Regis has a longer stretch of white sand beach, plus an inner lagoon for beginner snorkelers. But there's nothing more to consider here. Which has the most luxurious bungalows? St Regis boasts the largest, most luxurious over water bungalows (1500 sq ft) in Tahiti. These 77 over water St Regis bungalows feel more intimate than over at the Four Seasons, which has 100 over water villas. 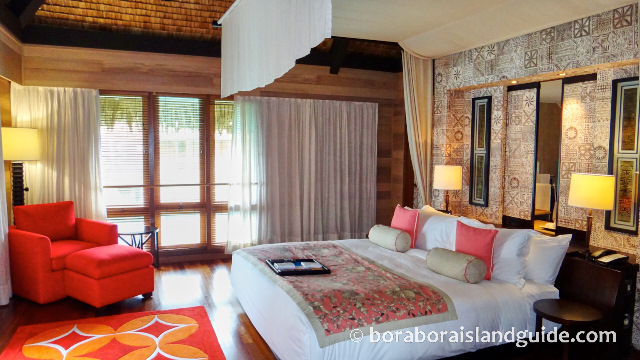 Four Seasons over water villas are 1000sq ft, which is also very spacious, considering that the bungalows at other Bora Bora resorts are around 500sq ft. Both resorts have stunning, but entirely different styles of decor. Stepping into the cossetting richness of the stunning St Regis bungalows I was transported into the world of kings and queens. Next door, at the fabulous, family orientated Four Seasons, the aesthetics are modern and airy. Romantic escape or family fun? Fun factor alone may help you decide the best resort for you. Four Seasons has dedicated kids' clubs for young children and teens. Over the northern summer (Bora Bora's winter) many families are attracted by having all day (safe) entertainment for their children. So St Regis has largely become a 'couples resort' where those wanting privacy can relax in seclusion. This theme includes an intimate 'adults only' Oasis Pool with comfortable private cabanas. St Regis provides a regular shuttle service throughout the day, allowing guests freedom to spontaneously travel from the motu to explore and have a taste of eating on Bora Bora Island. The last shuttle back is 9pm. Four Seasons only has a complimentary 11 am morning shuttle boat. 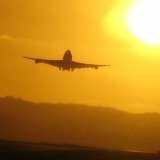 And a 6pm evening service which costs $140 per couple round trip. If you want to be independent you may need to hire a private taxi boat. St Regis has 4 world class restaurants and holds the reputation for serving the best resort meals in Bora Bora. Four season's dining is good, but regular Four Seasons clients say that it's not on par with Four Season standards that they are accustomed to, elsewhere. I still dream about this tempura tuna! Four Seasons has a reputation for impeccable service while the St Regis provides a personal butler service which attends to all kinds of guest preferences. Both resorts offer similar outdoor and indoor complimentary activities. 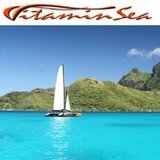 Both have inner-lagoons with marine biologists on site. Four Seasons also provides daily, supervised activities for children. The spa and fitness centers at Four Seasons are of a higher standard, if this distinction influences your hotel choice. Four Seasons guests must book tours through the hotel's excursion desk. 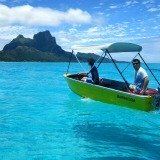 St Regis guests have freedom to choose their own excursion providers and get around Bora Bora independently. 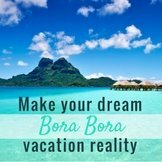 Want to marry in Bora Bora? 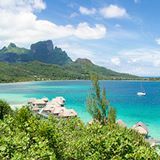 These two luxurious hotels are popular for Bora Bora weddings. Both have elegant wedding chapels featuring awesome views. The Four Seasons chapel would be the grandest of the two. St Regis has an inspirational wedding planner and bridal boutique. Staff are practiced at creatively attending to every teeny detail, including many you won't have thought of. It's the difference, that makes the difference, for hosting the perfect joyful occasion, declaring your love. 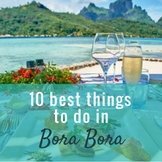 Which of the top Bora Bora resorts has your attention? There's no winner. 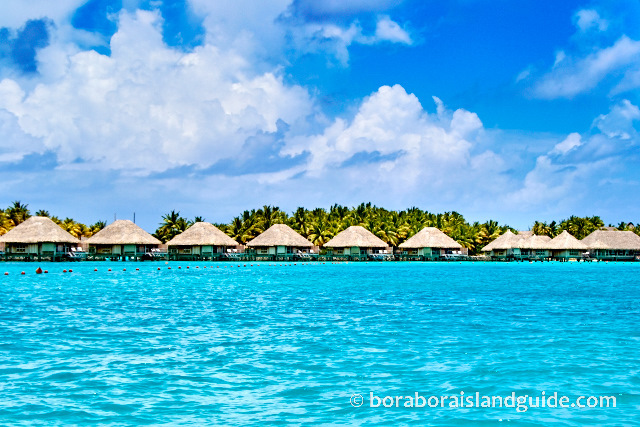 Your choice depends on how you will most enjoy a luxurious Bora Bora vacation. 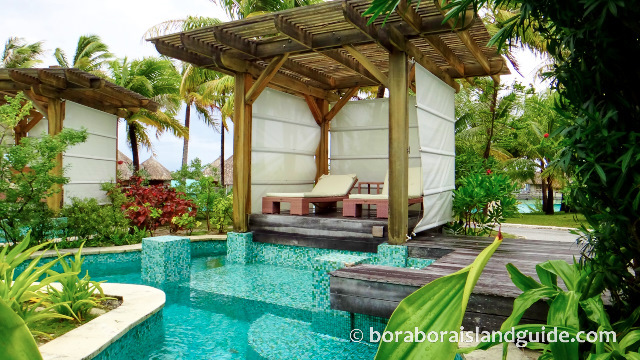 Find out more about what a stay at the Bora Bora St Regis offers. 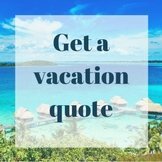 Or are you leaning towards the Four seasons because you're planning a family vacation? 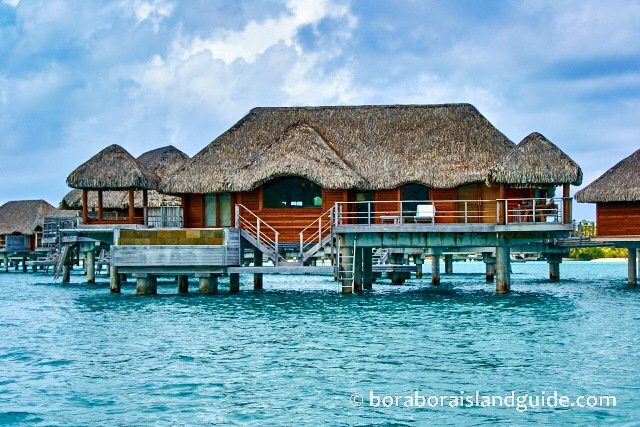 Want a Bora Bora luxury resort with a smaller price tag? 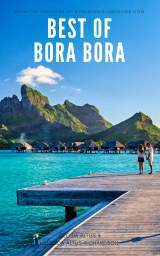 To vacation in luxury and spend less, we love the lavish Bora Bora vacation (and perks) this 4.5 star resort offers. See how the Intercontinental Thalasso compares. Are you still looking for additional information? You can use the Google search box below to search the site. 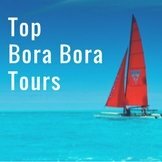 All about Bora Bora Island Guide and how we can help you make your dream Bora Bora vacation a reality. 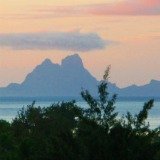 What is it like to vacation in a Conrad Bora Bora bungalow? Here's what it is like! 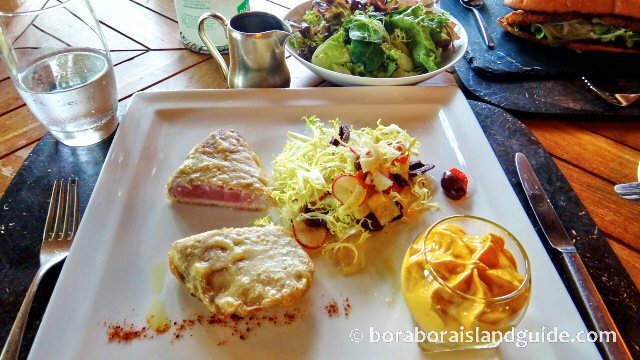 All of us at Bora Bora Island guide love to have fun, but we also have to keep the site up and running! That's why you'll see ads on this site. We may also earn commissions on some of the products on this site. 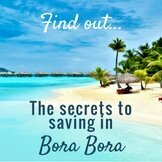 The income generated through these means helps ensure Bora Bora Island Guide can devote the time to providing you with all the free and fabulous information & resources you'll find here. 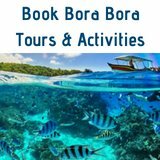 If you would like to support us, you can purchase our book full of over 100 pages of money saving tips or find out the best activities, resorts, dining and beaches in our Best of Bora Bora book or buy our 2018 Bora Bora calendar. Want to learn more? 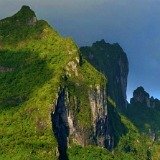 Bora Bora Island Guide invites you to read our advertising disclosure.